If the user just taps the “Like” button it will trigger a like, but if the user holds down the “Like” button it will launch the reactions pop up. This keeps the interface simple, but still provides easy access to the new reactions. It is an interesting design, and it is actually quite easy to implement in Ionic as well. This is a bare-bones implementation with not much effort put into styling it well, but if there is enough interest, I may do a follow-up blog post with a more complete implementation. We’re going to need some content to play around with, so if you don’t already have something with a “Like” button or an equivalent, you should add the following to your application. This is just using a <ion-card> example from the documentation. In order to achieve the reactions popup, we are going to use Ionic’s Popover directive, which will allow us to display a modal window next to an element. We can pass a component to Popover and it will display that component as a modal. The Popover component is documented as requiring a page, but an Ionic page is just a normal Angular component, so you don’t technically have to generate a “page” if you don’t want to – that is what we will be doing, though. All we are going to do on this page is add a few buttons, but we will also need to do some styling to remove a lot of the normal page styling which is going to make the popover look weird. This adds 6 buttons to a grid, and each of those buttons triggers a share function. This function won’t actually do anything, we will just use it to trigger the closing of the popover (but you could use it to do something else, of course). 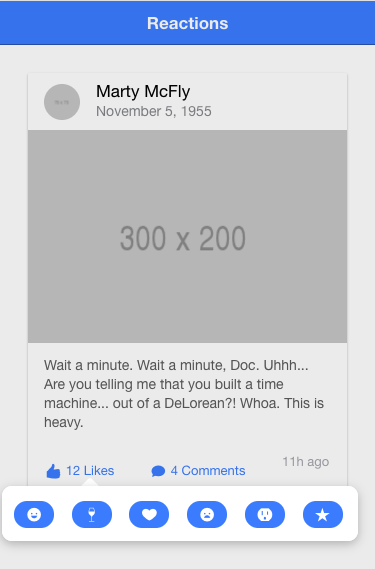 This just sets up the ViewController so that we can dismiss the popover when the share function is called. Now we just need to add a couple of styles. This will make our reactions page display nicely, but we are also going to make some additional style changes so that the popover that is displayed looks more like the Facebook reactions bar. This will modify the popover so that it takes up 95% of the width of the page. Finally, we are going to add a global style to give the popover a bit more of a shadow. We have our reactions popover set up nicely – now we just need to trigger it. We are going to add two handlers to our “Like” button to handle cases where the user just taps, and cases where the user holds down on the like button. We are creating an event binding for the press event, which will only trigger if the user taps and holds down on the screen. It’s important that we pass the $event through to the showReactions function because, in order for the popover to know where on the screen it needs to be displayed, it needs access to the pointer event that triggered it. Now we just need to create the functions to handle these events. When we call the present method on the popover, notice that we are sending the event we passed in along with it. I’ve also added some code to the constructor that will prevent the context menu from launching. This is not required for production, but if you are using the Chrome device simulator, the context menu is triggered by clicking and holding on the screen. Since this is the same way that our reactions popover is triggered, it makes it annoying to test. This was a reasonably simple tutorial, but it is quite a cool little technique. As I mentioned, if there is enough interest I may do a more advanced implementation that more closely mimics Facebook’s implementation.